Orchids are one of the most diverse and also largest group of plants. The number of officially documented orchid species is more than 25,000 and there are approximately 800 genuses. The size of the flower depends on the species. Orchids have the tiniest seeds in the world. These plants can live to be up to 100 years old. Some wild species have been known to live for as long as 200 years. They belong to the Orchidaceae family. Instead of having a classical root, these plants have rhizome, tuber or aerial roots. Some orchid species are parasitic as they are not able to produce food. Phalaenopsis orchids are known as Moth Orchids because of the appearance of the blooms. 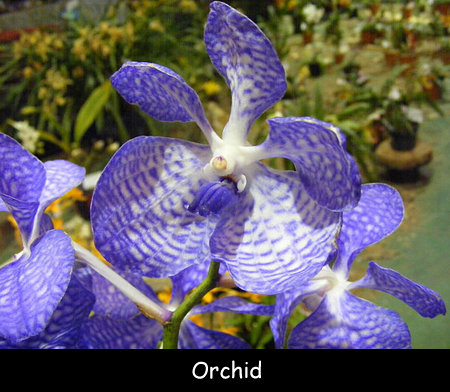 Orchid flowers are bilateral symmetric that means they can be divided in two equal parts. These seeds do not have an endosperm which provides nutrients required for the germination. Vanilla is extracted from the pod of a species of orchids known as Vanilla planifolia. Vanilla planifolia is also the only commercially grown orchid crop. Depending on the species, these flowers can survive for a period ranging from a few hours to six months. Orchids are generally thought of as a tropical plant but they grow on every continent. Many species of these flowers are shaped and colored to mimic the appearance of bees. Declan, Tobin. " Amazing Facts for Kids about Orchids ." Easy Science for Kids, Apr 2019. Web. 26 Apr 2019. < https://easyscienceforkids.com/orchid-facts/ >.